Pet owners are more conscious than ever about buying a pet carrier that provides safety and comfort. The Sherpa Original Deluxe Pet Carrier has these features, and it also looks great! Designer pet carriers are becoming more popular, and the Sherpa Pet Carrier fits the bill. But, it offers more than just a sleek look. It’s one of the most popular pet carriers on the market – and for a good reason! This carrier is highly-recommended by several trusted organizations. It’s praised for its safety features and the comfort it provides for your pet. It has practical travel uses. So, whether you’re going to the vet or on a long road trip, the Sherpa Carrier can fit your needs. Sometimes, the ‘original’ model of a product is the always going to be the best. The Sherpa Deluxe carrier has a lot to offer, including extra features you and your dog (or cat!) will love. But, is it the right carrier for both of you? Learning more about its features and how it can keep your pet safe will make it easier to decide. CLICK HERE to Find Out Why Buyers Love the Sherpa Pet Carrier on Amazon! 1.2 What Are the Safety Features? 1.3 Is it Comfortable for My Pet? 1.4 Is It Suitable for Air Travel? 1.6 Is It the Best Soft-Sided Pet Carrier? This is a highly-recommended product with many uses. You can take it with you anywhere you go and take comfort in knowing your pet will be safe the whole time. With so much high praise, is this carrier worth it? This review will dig deeper into the features of the Sherpa Original Deluxe. Having a better understanding of those features will allow you to decide if it’s right for your pet. For a pet carrier that offers this much comfort and safety, the wide variety of colors is an obvious bonus. Dimensions: 15 inches long, 8.5 inches high, and 10 inches wide. Suggested pet weight is up to 8 pounds. Available colors for the small size are Paisley, Plum, Black, Brown, and Gray. Dimensions: 17 x 11 x 10.5 inches. Suggest weight is up to 16 pounds. Available colors for the medium size are Paisley, Plum, Black, Brown, Gray, Blue, and Purple. Dimensions: 19 x 11.8 x 11.5 inches. Suggested maximum pet weight is up to 22 pounds. Colors include Red, Paisley, Plum, Black, Brown, and Gray. CLICK HERE to Read the Latest Customer Feedback for the Sherpa Original Deluxe Pet Carrier on Amazon! One thing that makes the Sherpa Original Deluxe carrier stand out from the competition is its safety features. This carrier comes with praise from several notable organizations. This includes the ASPCA and Humane Society. It is also often recommended by veterinarians. Ventilated sides: Proper ventilation is critically important. It keeps your pet cool and makes it easier to breathe. The mesh sides also give your pet a chance to look at their surroundings and make it easy for you to see them at all times. Locking zippers: If you’re traveling, you always want to make sure your pet can’t get out of the carrier. The locking zippers on this bag ensure that your pet will stay securely inside and won’t be able to break through the zippers. Seat belt strap: This carrier comes with a nylon strap that makes it easy to attach to a seatbelt in the car. If you’re going on a road trip or just a vet visit, this can be a big help. It will ensure your dog or cat doesn’t slide around the seat and risk falling. Reinforced handles and bottom: Because it’s made for travel, durability is essential to the structure of the Sherpa Original Deluxe carrier. That’s why the bottom and handles of the bag have been reinforced. You don’t have to worry about handles breaking off or tearing, or the bottom falling through while your pet is inside. Is it Comfortable for My Pet? Aside from safety features, most pet owners want to make sure their dog or cat will enjoy being inside a carrier. So, comfort can be a big deal, especially when you’re traveling with a nervous animal. If you do have a dog or cat who has a hard time getting in carriers or crates, you can use the top entrance to lower them in. This usually keeps animals calm when they’re being put into a carrier. You should never have to force a pet into a carrier if they don’t want to go through the front entrance. Other features for your pet include a faux lambskin liner, which is washable. It’s also leak-proof. So, if your pet has an accident while in the carrier, they don’t have to worry about sitting in their mess, and you don’t have to worry about embarrassment from a leaky carrier! Again, the mesh siding makes this a cool and comfortable carrier for your pet. They won’t get overheated and will love being able to see you. Is It Suitable for Air Travel? 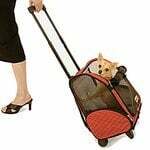 Not all pet carriers are suitable for taking on a plane. 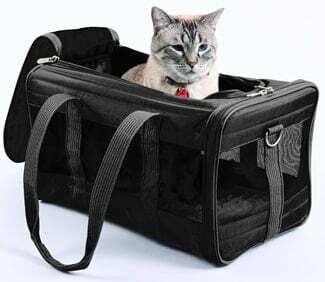 But, the Sherpa Original Deluxe Pet Carrier is an airline-approved carrier. You can put it right underneath your seat to have your dog or cat with you at all times. But, it’s great for any type of travel. You can take it with you in the car and ensure your pet will be secure no matter how long of a trip you’re taking. It’s not necessarily a kennel. But, because of its size and shape, as well as the entry points, some pets enjoy it as a small ‘home.’ You can get your dog or cat used to being in the carrier by having it in your home for them to try. It can become a safe haven for them. Getting them used to the carrier before you take it on a long trip is a good idea, so make sure you choose the right size to keep your pet comfortable. When you’re not using it, it folds away flat, so you don’t have to take up a ton of storage space. If you want something that functions more like a kennel in your home, you might want to try the Aspen Pet Porter Plastic Kennel. With so many high recommendations, there are only a few potential drawbacks. It’s important to weigh out the pros and cons when you’re choosing the perfect pet carrier. So, let’s take a closer look at what you should know, and how these features can affect you and your pet. It has pockets for storage of treats, medicine, leashes, etc. This may not be the best carrier for cats or dogs who like to scratch or play rough. The mesh siding is excellent because it allows your pets to see and breathe freely. But, if it’s scratched at too often, it may tear. That can put your pet at risk for escaping and getting lost. Other than that, there are many more advantages to this carrier than disadvantages. If you have a pet who can be mostly calm inside the carrier, and you measure them correctly, you shouldn’t have many problems. Is It the Best Soft-Sided Pet Carrier? As you can see, there are many benefits to the Sherpa Original Deluxe Pet Carrier. It’s one of the best soft-sided carriers on the market and has the recommendations to back it up. It’s great for a family trip across the country or a quick trip to the vet, and anything in between. This Sherpa carrier is a perfect example of a great balance between features for your pet and features for you. Your dog or cat will feel safe, secure, and comfortable when they’re relaxing in the carrier. You’ll feel just as secure and confident knowing about all the extra safety features. If you have to take it through an airport or hold it for a long time, the reinforced handles will stand the test of time. We hope this review has been helpful if you’ve been looking for a quality pet carrier. If you’re looking for something collapsible and soft-sided, it’s hard to go wrong with the Sherpa Original Deluxe. CLICK HERE to Check the Current Price of the Sherpa Original Deluxe Pet Carrier on Amazon!